Fourth Row Center: Film Writings by Jason Bailey: On DVD: "TCM Greatest Classic Films Collection: Hitchcock Thrillers"
On DVD: "TCM Greatest Classic Films Collection: Hitchcock Thrillers"
Ask the average moviegoer with at least a passing knowledge of film history to name some Hitchcock films, and they’re more than likely to call up something from his late Universal period: Rear Window, Vertigo, Psycho, The Birds. These were the years in which the master of suspense was firmly entrenched as one of the world’s few superstar directors, a man whose name above the title was just as likely to pull an audience as the (considerable) stars who fronted them. Hitch became a brand, thanks to his successful TV show, his anthology magazines and books, and so forth—people saw him every week on their televisions, using his droll wit to introduce tales of suspense and horror. But his mass success was hard-earned; he’d been making movies since the silent era, cultivating his particular style in pre-war England before coming to the States in 1939, signing a lucrative multi-year deal with David O. Selznick. Under that contract, he directed his first big Stateside hits (Rebecca and Foreign Correspondent), before Selznick loaned him to RKO as part of a package deal with Joan Fontaine (whom he’d just directed in Rebecca) to make Suspicion. The picture marked his first collaboration with Cary Grant, who would star in a total of four Hitchcock movies and is considered by many to be the perfect Hitchcock leading man (though there’s certainly an argument to be made in Jimmy Stewart’s favor as well). Grant plays a handsome, unapologetic lout; his Johnnie is a sharp-dressed dandy who has never worked a day in his life and, contrary to appearances, doesn’t appear to have a dollar to his name. In the arresting opening scene, he shares a train compartment with Lina (Fontaine), and Hitchcock deftly uses intercut close-ups, almost directly into camera, to create a rather unnerving point-of-view camera that plunges the viewer right into the middle of their tense, awkward flirtation. After an odd, strained courtship (Johnnie’s affectionate pet name for Lina is, um, “Monkeyface”), the pair are married, and Lina starts to get an idea of exactly what she’s in for; Johnnie is an irresponsible, flighty leech with a gambling problem. The screenplay (credited to three writers, including Hitchock’s wife Alma) strikes a peculiar tone in its second act, delving into the waters of domestic comedy/drama and marital strife, in a style not dissimilar to Hitch’s undervalued comedy Mr. & Mrs. Smith from the same year, but with occasional sinister overtones. But then, as Lina begins to suspect that her husband may have murderous intentions (first towards his friend “Beaky,” played by Nigel Bruce of the Sherlock Holmes pictures, then towards her), Hitchcock introduces a sense of dread—first subtly, then wildly (Franz Waxman’s music is enjoyable bombastic). Watch the way Harry Stradling’s lighting scheme shifts as the film becomes a potboiler in the third act; during Lina’s frightened stroll through the foyer of their home, the shadows of the window frame her like a spider caught in a web. Hitchcock spent the remainder of the 1940s cultivating his style, crafting such masterpieces as the Thorton Wilder-penned small town drama/thriller Shadow of a Doubt, the stunningly effective 1946 love triangle Notorious, and the tense 1948 experiment in unbroken photography Rope. But he made one of his greatest films for Warner Brothers in 1951, the quintessential elegant Hitchcock thriller, Strangers on a Train. The story is one of his best-known (thanks in no small part to its reworking as Danny DeVito’s 1988 black comedy Throw Momma from the Train): Tennis ace Guy Haines (Farley Granger) strikes up an on-train acquaintance with an odd man named Bruno (Robert Walker), who’s full of peculiar proclamations like “I certainly admire people who do things” and “People who do things are important!” In the process of their chat, both reveal the identity of someone who their life would be easier without; for Guy, it’s his first wife, a philandering good-time girl who won’t let him out of the marriage so he can wed his true love Anne (Ruth Roman), while Bruno longs to be ride of his hidebound father (Jonathan Hale). Bruno explains that they have stumbled upon the perfect murder scheme—they each take on the other’s murder for them, since neither man would have a motive for the other killing. Guy thinks Bruno is joking around, but he comes to realize exactly how serious the affable chap is. The film’s first carnival sequence, in which Bruno stalks and kills Guy’s estranged wife, is pure, perfect Hitchcock: inventively assembled, beautifully photographed, subtly menacing, and filled with splendid moments (Bruno’s encounter with the kid holding the balloon) and jaw-dropping trick shots (the reflection of the deed in her fallen eyeglasses). Indeed, the picture contains some of Hitch’s most potent visuals (such as the moment Guy spots Bruno in a tennis match crowd). It’s also one of his most clever screenplays, adapted from the novel by Patricia Highsmith (who wrote the “Ripley” books) by the great Raymond Chandler and Czenzi Ormonde (with an uncredited assist by the legendary Ben Hecht). The dialogue scenes between Guy and Bruno are affably uncomfortable at the top of the picture, gradually growing more and more tense (and more and more rife with homosexual subtext). But it’s also a witty script, full of funny toss-off scenes like Bruno’s discussion of murder planning with a pair of dowagers at a ritzy society ball (a scene which is followed by the great line, “This is a nice thing for the gossips—next thing you know, they’ll be talking about orgies!”). Able comic relief is supplied by Hitch’s daughter Patricia, who turns in a spark-plug of a performance as Anne’s slyly funny, bespectacled sister Barbara. Hitch pulls the picture taut as it barrels to its conclusion; the construction is whip-smart, and the craftsmanship is superb. A misplaced lighter becomes the film’s MacGuffin (Hitchcock’s buzzword for the thing that the plot hinges on, just so it hinges on something), leading both Guy and Bruno back to the carnival grounds for the famed carousel ending. That suspenseful sequence keeps upping the stakes—Hitch isn’t satisfied just having our hero fighting for his life, no, he’s got to put a little kid and old man in danger too, just for the hell of it. This is a director who’s having a great time thrilling an audience, and his efforts and effects work; Strangers on a Train is one of his best films. His follow-up to that highlight was the lesser I Confess, a picture that Hitchcock himself dismissed (in the Truffaut interview) as “rather heavy-handed” and “lacking in humor and subtlety,” ultimately stating that “we shouldn’t have made the picture.” It is certainly one of his weaker efforts. Montgomery Clift stars as Father Michael Logan, a priest who receives the confession of an accidental murder and must keep that secret, even when he is fingered for the crime himself. He’s brought to trial by Inspector Larrue (Karl Malden, in a workmanlike performance), who assembles his case based on the good father’s unfortunate associations with Ruth Grandfort (Anne Baxter), whom he loved before becoming a man of the cloth. The opening scenes are a bit turgid, delving into a melodramatic style that the film has some trouble shaking. The construction of the screenplay (by George Tabori and William Archibald, from Paul Anthelme’s play) is reasonably sturdy—I liked the way that they gradually reveal Ruth and Father Michael’s past—but the flashback scenes are corny (and done no favors by Dimitri Tiomkin’s otherwise able score), and they go on long after we’ve got the point. Hitchcock explores some interesting framings in the courtroom scenes, and the closing sequence is cogent, if predictable. Clift is a peculiar casting choice—his hyper-realistic performance is seemingly at odds with Hitchcock’s flamboyant, theatrical style (they reportedly did not get on well on set), though Hitchcock seems to recognize the power of a tight close-up on Clift’s quietly expressive face. He seems, in fact, to be purposely attempting to work in a more naturalistic style, shooting on location (he makes fine use of the film’s Quebec settings) and toning down the razzle-dazzle. Trouble is, he drains the passion as well. I Confess is not a bad film by any stretch, but it is a rather dull one. Henry Fonda is the title character, a jazz musician and family man who all but seals his fate early in the film when his wife asks him, “Aren’t we the lucky people?” and he replies “Sure we are.” Not for long. He is mistaken for an armed robber (in a nice bit of foreshadowing, he is framed behind the bars of a teller’s window), he is arrested and charged, and his attempts to make a case for his innocence prove so difficult and fruitless that his wife is driven to insanity. Perhaps due to the “based on a true story” construct, Hitchcock shoots the film with fewer frills and a more direct style (he only engages in two trick shots: a rather unfortunate scene inside Fonda’s first cell, and a more effective bit that follows him into a cell through the slot in the door). The results are compelling and effective. He doesn’t have to amp up the drama for us—in a quietly disturbing sequence like Fonda’s visits to the scenes of his purported crimes, the straightforward (almost documentary-style) photography serves the story masterfully, and paints a portrait of Hitchcock as a director of enormous tact and control. In some ways, it’s his police procedural—Law and Order forty years before its time. When the case goes to trial, the setting shifts to a room unlike any movie courtroom you’ve ever seen—it’s dull, people chatter, and no one’s paying much attention. The portrayal of a half-assed justice system gels nicely with the earlier scenes conveying Fonda’s helplessness at being zipped through a maze of confusing bureaucracy. Fonda shoulders the bulk of the picture handily with his no-nonsense performance, while Hitchcock regular Vera Miles, as his wife, handles the unexpected turn of her character to near-nihilistic madness well—it sounds contrived, but within the context of the story and the confines of her grounded performance, it’s entirely convincing. The climactic religious overtones are a touch heavy-handed, and the film’s potentially powerful closing confrontation deflates in the face of a weak line, poorly delivered. But for most of its running time, The Wrong Man is an undiscovered Hitchcock gem, showing the master working outside of his comfort zone and maintaining his considerable power over the form. Not all of the pictures presented in TCM Greatest Classic Films Collection: Hitchcock Thrillers are among Hitch’s best, but even the weaker ones are interesting, if for nothing else than for their place in the great filmmaker’s canon. With one legitimate masterpiece (Strangers) and one underrated work (The Wrong Man) in the mix, along with mostly-sturdy audio and video and some fine bonus features, this bargain-stickered collection is a steal at twice the price. 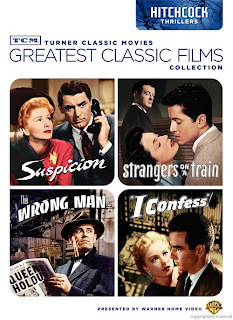 "TCM Greatest Classic Films Collection: Hitchcock Thrillers" hit DVD on Tuesday, November 3rd.